Glulam | Houston, TX - R. M. Rodgers, Inc. When you need high-quality custom glued laminated timber in Houston, TX, and the surrounding area, turn to our company. Backed by more than 50 years of experience, R. M. Rodgers, Inc. is a leading provider of durable glulam structures and subcontracting work. The natural beauty of wood and its potential for inspirational creative designs make laminated timber ideal for worship spaces, as well as arches, trusses, and other curved structures. This material allows architects to enjoy outstanding design freedom. Feel free to browse our gallery for a glimpse at the kind of glulam system options that are open to you. R. M. Rodgers, Inc. wants to keep you current on the ways the construction industry is using our services, and how we can help you as well. By taking advantage of our services, your clients will enjoy the same outstanding results. You will find that our timber and wood glulam systems offer countless design possibilities, and our team of experts can even help you achieve them. We also offer helpful information regarding structural laminated glulam timber roof systems, as well as Lock-Deck laminated wood decking. • Attractive Appearance – Glulam offers the warmth and traditional style of natural timber but the strength and flexibility you need to create a safe, long-lasting structure. 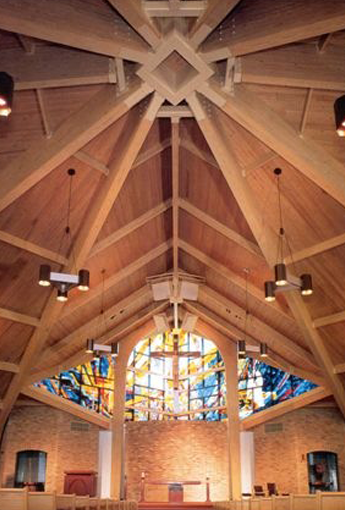 Glulam is often used in churches and building designs that utilize curved tresses or beams, such as those used in domed ceilings. • Strength to Weight Ratio – For its weight, glulam is an incredibly strong material. This makes it incredibly easy to work with and manipulate while also providing a strong and safe basis for the rest of your building. Whether you’re building a loft, balcony, or other structure, laminated timber is an ideal choice. • Long-Lasting Durability – The durability of glulam depends on the species of timber and type of glue and laminate used. However, no matter what type you choose, you’re sure to get a long-lasting product that requires minimal maintenance. Glulam systems are often used in indoor swimming areas because laminated timber can stand up to the humidity and strong chlorine fumes in the area. • Fire Resistance – Although you wouldn’t think that timber would be a good material to use to prevent fire, it’s actually very beneficial. Because timber chars at a well-known rate and doesn’t buckle or collapse like metal, glulam is a great choice for any building. There are many protective finishes available as well to increase the fire resistance of your glulam system. When you’re ready to discuss your needs, get in touch with our friendly team. We’ll help you decide precisely what type of laminated timber you need for your construction project and help you schedule service with one of our subcontractors. Contact us to discuss your needs. We proudly serve clients in the Houston, Texas, area. We Proudly Use Materials from Structural Wood Systems & Disdero Lumber Co.